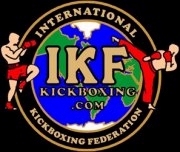 IKF CALIFORNIA Judges: Marcos Guevara, Francisco Granillo & Alternating Referees. Judge Marcos Guevarra: 30-27 Datta. Judge Vichai Supkitpol: 29-28 Datta. Judge George Valdez: 30-27 Coronado. 5-31-16: Coronado has been suspended 90 days or UNTIL he submits a FULL FIGHTER PHYSICAL to the IKF. Cannot be booked for a bout UNTIL IKF has a FULL Physical from him - CLICK HERE..
5-27-16: TKO SUSPENSION: Khalil Mohammed was issued a 30 day no training and 45 day no competition Medical Suspension after TKO until July 12, 2016. 5-27-16: CUT SUSPENSION: Khalil Mohammed was issued a 60 day no training/competition until July 26, 2016 for a cut over the left eye by Dr. Mitch Jelen M.D. Can be cleared by any M.D. Judge Marcos Guevarra: 20-18 Berry. Judge Francisco Granillo: 20-18 Berry. Judge Vichai Supkitpol: 20-18 Berry. Judge Marcos Guevarra: 28-27 Lee. Judge Vichai Supkitpol: 28-27 Barcelo. Judge George Valdez: 29-28 Lee. 5-27-16: Mohamad El Jirari Barcelo was issued a 60 day No Competition disciplinary Suspension until July 26, 2016 for coming in 6.4 lbs over his booked weight of 160. 5-27-16: Matthew Vazquez was issued a 180 day no training and 180 day no competition Medical Suspension due to possible broken rib left side until November 24, 2016 by Dr. Mitch Jelen, unless cleared by M.D. and X-Ray. 5-27-16: Matthew Vazquez was issued a 60 day No Competition Disciplinary Suspension until July 26, 2016 for coming in 3.8 lbs over his booked weight of 170. 5-27-16: Jonathan Manalastas was issued a 30 day no training and 30 day no competition Medical Suspension after K.O. until June 27, 2016 by Dr. Mitch Jelen M.D. causing IKF to not be able to do an efficient background check. Submitted Misael Hernandez. 5-27-16: Nickcluas Gullusci was issued a 30 day no training and 45 day no competition Medical Suspension after K.O. until July 12, 2016 by Dr. Mitch Jelen M.D. Judge Marcos Guevarra: 20-18 Diaz. Judge: George Valdez 20-18 Diaz. Judge Marcos Guevarra: 29-28 Braud. Judge Francisco Granillo: 29-28 Gonzalez. Judge Vichai Supkitpol: 29-28 Braud. 5-27-16: Roland Braud was issued a 30 day No Competition Disciplinary Suspension until June 27, 2016 for coming in 1.9 lbs over his booked weight of 145. 5-27-16: Nick Jenkins was issued a 30 day no training and 45 day no competition Medical Suspension after KO until July 12, 2016 by Dr. Mitch Jelen M.D. 5-27-16: Pavel Pavlov was issued a 120 day no training and 120 day no competition Medical Suspension after KO and possible neck/spine injury until November 12, 2016 by Dr. Mitch Jelen M.D. Pavlov hit the back of his head/neck on the edge of the ring apron and was unconscious for several minutes. Pavlov was transported to the nearest trauma hospital for further evaluation. causing IKF to not be able to do an efficient background check. Submitted Eric Benjamin. Jose Tendilla, scheduled to fight **Christian Hernandez for a Defiant Promotional Title, was unable to fight due to a medical emergency that occurred after weigh-ins. Instead a tournament style bout was scheduled between Christian Hernandez and the winner of bout 1 (Sujit Datta) for the title. (***Full Bout History was still required, which was never sent in. So bout was still going to be a HEADGEAR BOUT. 7:PM TO 9 PM SHARP! BOTH FIGHTERS NEED TO HAVE A FULL PHYSICAL. CAN BE DONE BY EVENT DOC AT WEIGH-INS FOR $40: CLICK HERE. 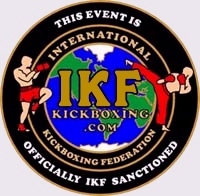 BOTH FIGHTERS NEED TO SUBMIT AN IKF UPDATE FORM: CLICK HERE. Said Coronado ( Mission Hills, California, USA, 0-2, AMMA: 1-0? ?, 5'11", 8-9-83, Daniel Gutierrez, (818) 397-9293, - (FP: 12-13-14) - (RN: 12-13-15) - (LU: 2-8-15). Misael Hernandez NEEDS TO GET IKF LICENSED: CLICK HERE. Misael Hernandez NEEDS TO HAVE A FULL PHYSICAL. CAN BE DONE BY EVENT DOC AT WEIGH-INS FOR $40: CLICK HERE. Jonathan Manalastas NEEDS TO SUBMIT AN IKF UPDATE FORM: CLICK HERE. Nickcluas Gullusci NEEDS TO GET IKF LICENSED: CLICK HERE. Nickcluas Gullusci NEEDS TO HAVE A FULL PHYSICAL. CAN BE DONE BY EVENT DOC AT WEIGH-INS FOR $40: CLICK HERE. Julio Diaz NEEDS TO SUBMIT AN IKF UPDATE FORM: CLICK HERE. Anthony Saiz NEEDS TO GET IKF LICENSED: CLICK HERE. Anthony Saiz NEEDS TO HAVE A FULL PHYSICAL. CAN BE DONE BY EVENT DOC AT WEIGH-INS FOR $40: CLICK HERE. Nick Jenkins NEEDS TO SUBMIT AN IKF UPDATE FORM: CLICK HERE. NO HEADGEAR OR SHIN PADS REQUIRED - IKF APPROVED ELBOW PADS ARE REQUIRED. 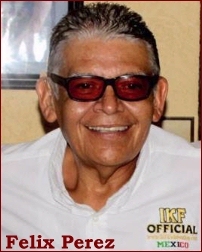 Edgar Gonzalez NEEDS TO GET IKF LICENSED: CLICK HERE. Edgar Gonzalez NEEDS TO HAVE A FULL PHYSICAL. CAN BE DONE BY EVENT DOC AT WEIGH-INS FOR $40: CLICK HERE. Pavel Pavlov NEEDS TO SUBMIT AN IKF UPDATE FORM: CLICK HERE. 5-23-2016: BOTH FIGHTERS MUST WEAR HEADGEAR AND SHIN PADS. UNLESS Jonathan Hernandez can PROVE his claimed 5-1 record by sending in to the IKF a PAST BOUT HISTORY FORM BEFORE 12 NOON, Wednesday, May 25th, 2016: CLICK HERE. Jonathan Hernandez NEEDS TO GET IKF LICENSED: CLICK HERE. Jonathan Hernandez NEEDS TO HAVE A FULL PHYSICAL. CAN BE DONE BY EVENT DOC AT WEIGH-INS FOR $40: CLICK HERE. Jose Tendilla NEEDS TO SUBMIT AN IKF UPDATE FORM: CLICK HERE. Willie Barcena NEEDS TO GET IKF LICENSED: CLICK HERE. Willie Barcena NEEDS TO HAVE A FULL PHYSICAL. CAN BE DONE BY EVENT DOC AT WEIGH-INS FOR $40: CLICK HERE. Marco Sanchez NEEDS TO SUBMIT AN IKF UPDATE FORM: CLICK HERE. For 2016 IKF World Classic! After 6 months of having an Glory / K-1 Rules Division (Unified) available for this years 2016 IKF World Classic, the IKF has pulled the plug and replaced the Unified Rules Division with Full Contact Rules. Although the interest in above the waist Full Contact Rules is not what it use to be here in North America, apparently it's more popular than Glory / K-1 rules. Without even offering the style on the registration form, 13 Fighters registered for the division hoping the IKF would add it back in. Although 13 doesn't seem like a lot, it's over twice as many who had registered for the Glory / K-1 "Unified" Rules Division. Only 5 fighters checked the box for Unified rules and not one bout was confirmed. 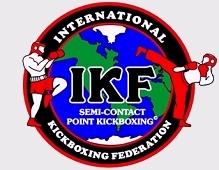 IKF has officially closed the Unified Division and changed it out on all the registration forms and bracket pages for Full Contact Above the Waist Rules. It was just last April 13th, 2015 that IKF posted an article entitled, "Is It Time To Say GOOD-BYE To Above The Waist / Full Contact / American Style Kickboxing?" Time will tell now if Full Contact Above the Waist Rules builds any more fighters for this year. 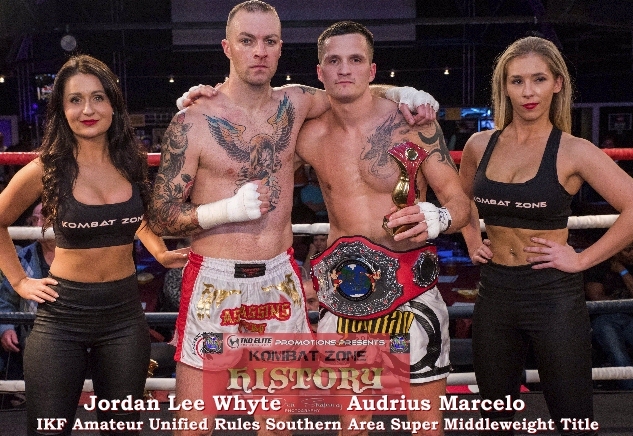 If not, maybe the better move for the IKF World Classic Tournaments is to just stick with 2 rule style divisions, International & Muay Thai Rules. 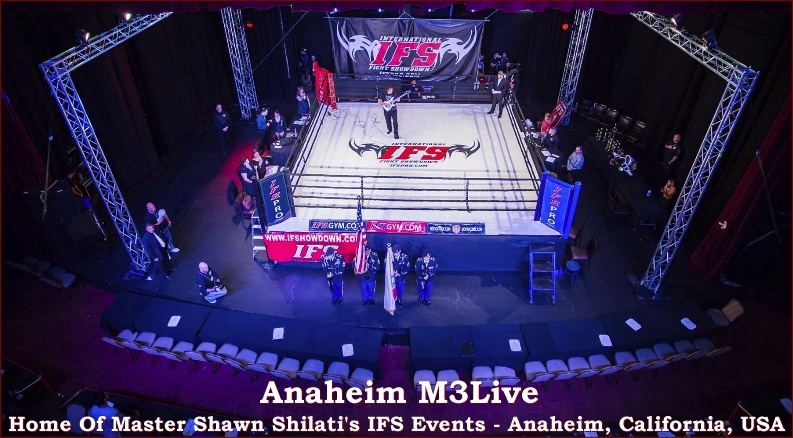 The lack of interest has been no surprise to the IKF having witnessed directly the lack of spectators at both the Pro Glory Promotion events and the past Pro K-1 Promotion events here in the USA. Seems like while these promotions are doing better overseas, MMA (Mixed Martial Arts) has continued to capture today's Kickboxing and Muay Thai fans. Even the Pro Lion Fight Promotion is not getting the crowds Kickboxing use to get back in the 90's and early 2000. Clearly the sport is needing a promotion that will build more fighter's from the regions they promote their events in, which has been the biggest downfall witnessed of all three of these pro "Mega" promotions. Although Bellator is preparing to change the game with their own brand of Kickboxing, no one can be sure if even they will have what it will take to move the spectator viewing needle... Even with superstar promoter Scott Coker running the show. 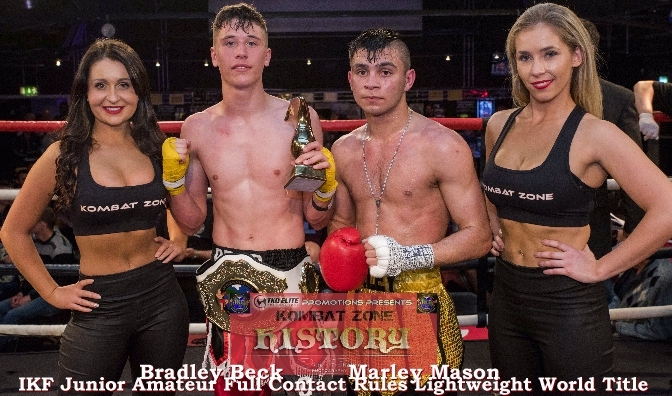 Kickboxing "AND" Muay Thai needs more PRO Promotions to give each sport the shot in the arm they need. However, that missing link of "$$$" is something these other Pro Promotions have somehow found... But HOW? Because sadly it's been how they spend those "$$$" that's been their own downfall and you have to wonder, "Why are they still being funded..."? Although these promotions have found or developed a few USA based stars they continue to think that bringing in fighter's from other countries across the ocean are what the fans want... But it's NOT! 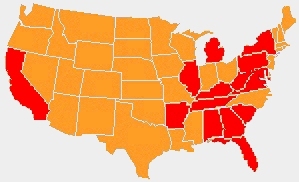 Most of them are not even known in the cities the events are held in let alone to the remainder of the USA or North American fan base. Staying with such a practice goes against simple "How to Promote An Event 101" basics... Even UFC realized this as they built their fighters from within the USA before reaching out overseas. If the big Pro Promotions of Kickboxing and Muay Thai continue with this practice we may continue to see empty seats at all their events. At this years 2016 IKF World Classic? For This Year Is THURSDAY - May 26th, 2016 and the Final Deadline is 5:00 PM/PST, FRIDAY, JULY 8th, 2016. To see all the Deadlines for the 2016 IKF World Classic, click HERE! FOR ALL EVENT INFO CLICK HERE! The event will host a defense of Cesar "El Mego" Palomera's (Puerto Vallarta, Mexico 15-0-1) IKF (International Kickboxing Federation) Pro Muay Thai Super Lightweight World title. The event will take place in Puerto Vallarta on the 17th of February of next year. Yesterday in a press conference by the representative of the IKF in Mexico, Felix Perez (Left) announced the preparations for this great event, in which it is hoped the attendance of more than 4000 spectators. 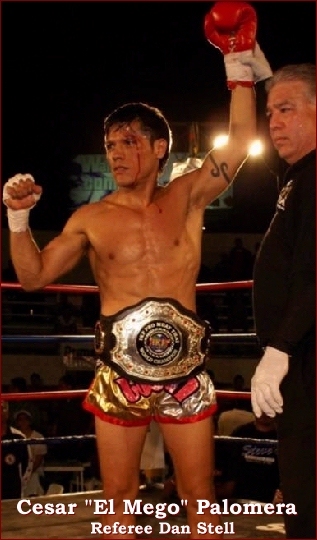 Palomera won the title on April 30th, 2010 in Puerto Vallarta, Mexico when he defeated Mark Deluca (Pittsburgh, Pennsylvania, USA, 14-8-1) by knockout at :38 seconds of round 2. the event was titled, "Fight of the Bicentennial" and was held at the Plaza De Toros La Paloma in Puerto Vallarta. Palomera destroyed Deluca with a third brutal knockdown and TKO stopped by referee Dan Stell 38 seconds into the 2nd round. Palomera also held the IKF Pro Muay Thai Mexico National title but now, as World Champion, this title will be challenged for by José Luis "Lightning" Uribe (Left) and an opponent yet to be named. "I came to surprise the call of Mr. Felix, for the time that it takes for the event, but I feel motivated and happy to participate for the title of a partnership very important ", Expressed Uribe. 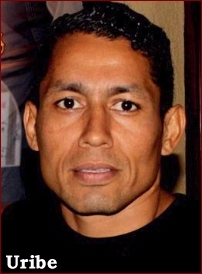 Palomera won the IKF Pro National title on October 31st, 2008 in Las Palomas, Mexico when he defeated Jose Francisco Ramos in the final seconds of the 2nd round as Ramos was unable to fight back. IKF CALIFORNIA Locker Room Inspectors (4): Ron Estrada, Jesse Gasca, Noah Trujillo & Rathbovor Ren. Defeated **Theron Anjsuco (Long Beach, California, USA, 0-1, 125.7, 5'6", 10-11-80, Mark Kamuro, (213) 706-6827, - (FP: 5-20-16) - (RN: 5-20-17) - (LU: 5-22-16) by KO at :40 seconds of round 3. Theron Anjsuco was issued a 30 day no training and 45 day no competition Medical Suspension after K.O. until July 7, 2016 by Dr. Audrey Konow. Judge Jim Vanover: 19-18 Kyburz. Judge Pongsan Cheun-Niran: 19-18 Kyburz. Judge Vichai Supkitpol: 19-18 Kyburz. Judge Jim Vanover: 28-28 Draw. Judge Pongsan Cheun-Niran: 28-27 Alcocer. Judge Vichai Supkitpol: 28-28 Draw. (**) "Jose" Alfonso Alcocer was given a full physical form to complete but only did a pre-fight physical exam. "Jose" Alfonso Alcocer has been suspended until he presents a Completed Full Physical to the IKF. Must do so by June 1st or shall be suspended 6 Months and face possible fines. Defeated Mikayla Barut (Fontana, California, USA, 3-3, 123.1, 5'1'', 12-31-98, William Sriyapai, (909) 367-8956, - (FP: 5-23-15) - (RN: 5-23-16) - (LU: 5-22-16 ) by KO at :47 seconds of round 2. 5-21-16: Mikayla Barut was issued a 30 day no training and 45 day no competition Medical Suspension after K.O. until July 7, 2016 by Dr. Audrey Konow. Judge Francisco Granillo: 10-8 Mikayla Barut. Judge Pongsan Cheun-Niran: 10-8 Mikayla Barut. Judge Jim Vanover: 10-8 Mikayla Barut. Judge Francisco Granillo: 50-45 Paez. Judge Pongsan Cheun-Niran: 50-45 Paez. Judge Jim Vanover: 49-46 Paez. 5-21-16: Gustavo Del Valle was issued a 180 day no training and 180 day no competition Medical Suspension due to injury to right Shin until November 17, 2016 or until cleared by physician by Dr. Audrey Konow. 5-21-16: Diego Paez was issued a 180 day no training and 180 day no competition Medical Suspension due to injury to right Shin until November 17, 2016 or until cleared by physician by Dr. Audrey Konow. Judge Francisco Granillo: 48-47 Kim. Judge Pongsan Cheun-Niran: 49-46 Renier. Judge Jim Vanover: 48-47 Renier. Judge Francisco Granillo: 50-45 Todd. Judge Pongsan Cheun-Niran: 50-45 Todd. Judge Jim Vanover: 50-45 Todd. Judge Jim Vanover: 29-28 Paez. Judge Pongsan Cheun-Niran: 30-27 Paez. Judge: Vichai Supkitpol 30-27 Paez. Judge: Vichai Supkitpol 29-28 Antoci. Judge Pongsan Cheun-Niran: 29-28 Antoci. Judge: Jim Vanover 29-28 Antoci. Judge Francisco Granillo: 50-45 Alvarez. Judge Pongsan Cheun-Niran: 50-45 Alvarez. Judge Jim Vanover: 50-45 Alvarez. Judge: Jim Vanover 29-27 Som. Judge Pongsan Cheun-Niran: 29-27 Som. Judge: Vichai Supkitpol 29-27 Som. Judge Francisco Granillo: 50-45 Aviles. Judge Pongsan Cheun-Niran: 50-45 Aviles. Judge Jim Vanover: 48-47 Aviles. WINNER: Steve Raybould by unanimous decision, 50-45, 50-46 & 50-45. WINNER: Emily Kingshot by RSF at 1:29 of round 1. WINNER: Terri Stuart by unanimous decision 49-48, 50-45 & 50-45. WINNER: Finn Morgan by unanimous decision 30-27, 30-27, 30-27. WINNER: Kane Swansbury by unanimous decision 30-27, 30-27, 30-27. WINNER: Jake Kingshott by corner withdrawal end of round 1. WINNER: DRAW 30-30, 28-29, 30-27. 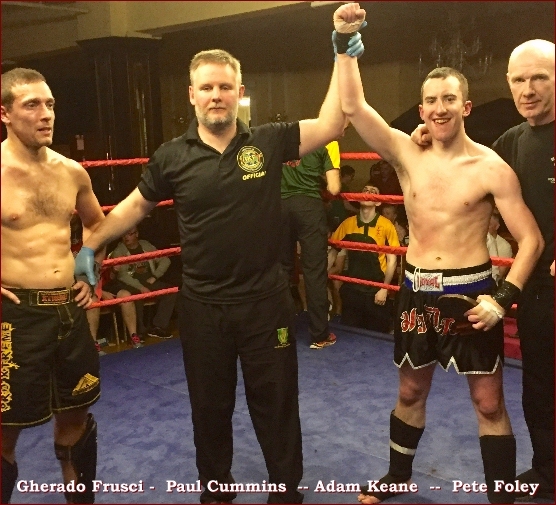 WINNER: Kaine Quinn by unanimous decision 29-28, 29-27, 29-27. WINNER: Dan Foley by RSF 0: 58 round 1. WINNER: Alex Jackson by split decision 30-27, 30-27, 28-29. WINNER: Elesha McQueen by majority decision 29-29, 29-28, 29-28. WINNER: Sonni Stuart by unanimous decision 29-28, 30-27, 30-27. WINNER: Ryan Tingle by split decision 30-27, 28-29, 29-28. WINNER: Ryan Walsh by unanimous decision 30-25, 30-25, 30-25. WINNER: Dylan Moran by unanimous decision 49-45, 50-42, 48-44. WINNER: Adam Jensen by majority decision 50-44, 48-46, 47-47. WINNER: Nathan McCarthy by unanimous decision 49-47, 50-46, 48-47. IKF CALIFORNIA Locker Room Inspectors: Chris Fields, Victor Zaragoeza, Nadine Salim, Jesse Pineda & Gene Fields. Judge: Susan Thomas-Gitlin: 29-28 Torres. Judge: Bruce Rasmussen: 29-28 Torres. Judge Dan Stell: 29-28 Arellano. Judge: Susan Thomas-Gitlin: 30-27 Wu. Judge: Bruce Rasmussen: 29-28 Parayno. Judge Dan Stell: 29-28 Wu. 5-21-16: 'Deo' Deofredo Parayno has been issued a 60 Medical Suspension for Cut (Lip) Until July 20th, 2016 by Dr. Gary Furness. Judge: Susan Thomas-Gitlin: 29-28 Diaz. Judge: Bruce Rasmussen: 29-28 Hernandez. Judge Michael Rinaldi: 29-28 Diaz. Defeated Akili Bean (Concord, California, USA, 2-2, S: 1, AMMA: 1-2, 166, 6'1", 10-15-95, Dan Black, (925) 813-0229, - (FP: 5-18-16) - (RN: 5-21-17) - (LU: 5-21-16)) by injury stoppage TKO at 1:28 of round 1. 5-21-16: Akili Bean has been issued a 180 Medical Suspension for his injured Knee until November 17th, 2016 for dislocated Knee by Dr. Mitch Jelen. Bean was transported by Ambulance - Can be cleared prior to 180 days by Ortho - Proof must be sent to IKF before being matched on any future bout. Judges: Susan Thomas-Gitlin, Bruce Rasmussen & Dan Stell. Defeated Alfred Meksavang ('Bird ' Alfred Robert Meksavang) (Fresno, California, USA, 1-3, S: 0, 169, 5'10", 9-25-89, Malipet Sasiiprapc, (559) 365-3902, - (FP: 10-4-15) - (RN: 2-6-17) - (LU: 5-21-16) by TKO at 1:06 of round 3. 5-21-16: 'Bird ' Alfred Robert Meksavang has been issued a 30 Day No Training And a 45 No Competition Medical Suspension for the TKO until July 5th, 2016 By Dr. Gary Furness. Bout Ended By TKO at 1:06 of round 3. (**) Meksavang was given a standing 8 in round 2. Judge: Susan Thomas-Gitlin: 30-27 Syvong. Judge: Bruce Rasmussen: 29-28 Syvong. Judge Dan Stell: 29-28 Peterson. Defeated Robby Squyres Jr. ( Squyers ) (Las Vegas, California, USA, 3-3, 258, 6', 7-23-91, Kru Sam Phimsoutham, (415) 333-3496, - (FP: 12-5-15) - (RN: 12-5-16) - (LU: 5-21-16) by injury stoppage TKO at 1:43 of round 1. 5-21-16: Robby Squyres Jr. ( Squyers ) has been issued a **180 Medical Suspension for his injured Knee until November 17th, 2016 by Dr. Gary Furness. (**) Can be cleared if Injury is recovered enough to train and compete. MUST show proof to the IKF before being matched for any bout. (**) Oscar Castro was given a Standing 8 in round 3. 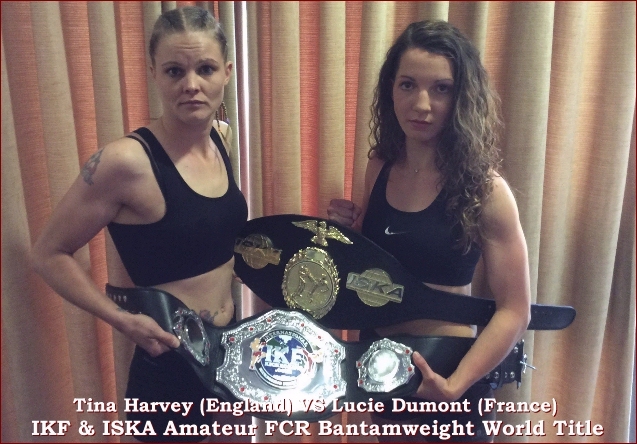 Tina Harvey faced a tough prospect in this defence of her IKF World title. Lucie Dumont was 16-0 coming into the bout and looked to possess a huge degree of Kickboxing skill. Harvey, as always wanted this in the trenches where she would look to wear down her opponent. But the first round was far from that and ended very evenly. However in the second she stepped up a gear and started to push Dumont off balance with her trademark front kick, punch combination. A number of illegal knee strikes from Dumont resulted finally in a point deduction and she now had it all to do. This was not a pretty contest but Harvey was getting the job done and the third and fourth rounds continued with her as the aggressor. 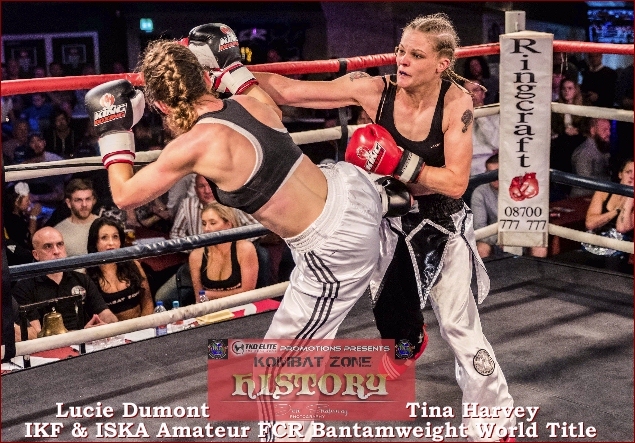 Dumont showed decent footwork at times, turning and throwing Harvey off balance but the Champion would not be denied and would smother any attempt at scoring with her own combinations. The French challenger knew early on that she would have to take it to Harvey and a trench war continued on into the fifth round, where both girls were now very tired. The last round was all about big punches. Harvey looking to finish and Dumont looking for a way back. Dumont was warned several more times for knee strikes and a final point deduction on the bell put the contest totally beyond reach. 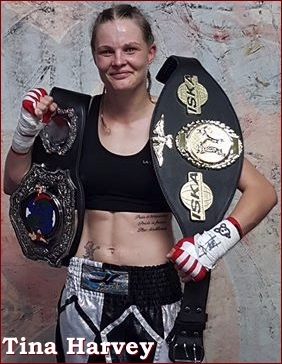 Tina Harvey, all heart and guts retained her IKF World title with a unanimous decision. WINNER: Tina Harvey by unanimous decision 50-43, 50-44 & 50-44. Splitting these two fighters was one of the hardest jobs of the night for the judges. Every single round was so close that four out of the five produced a different score from each. Clearly each corner (as always) thought that their man was ahead, but they both sent their fighter out for the last round to finish it. So it was clear that everyone knew it was very, very close. Both men matched each other, kick for kick and punch for punch and as a judge you had to work back through notes to secure a winner of the round. Looking at effective aggression, defence and style. 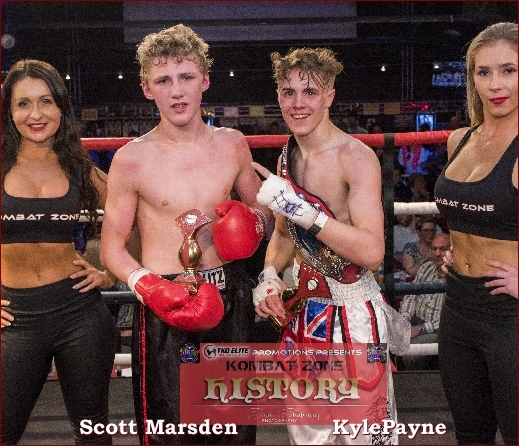 These are two fighters who will soon join the senior ranks and it will be an absolute joy to see what they can achieve. One judge was unable to separate them at the final bell but the other two managed to find a couple of extra points for Bradley Beck. This IKF European title contest was fairly brief and explosive as these welterweights clashed head on. Low kicks were exchanged and it was clear that this would not be a distance contest. In the early stages Packevicius looked stronger but it was not long before Skordilis found his range and began scoring with good combinations. In the second the Lithuanian began to fall behind a little as Skordilis got stronger. But it was still anyone's fight to take and Packevicius picked up useful points with knee strikes. 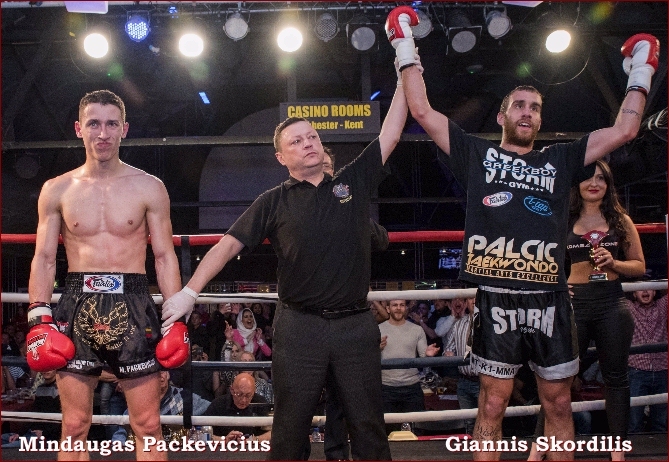 WINNER: Giannis Skodilis by KO at 2:14 of round 3. Mindaugas Packevicius was issued a 45 day IKF Medical Suspension until 29th June 2016. 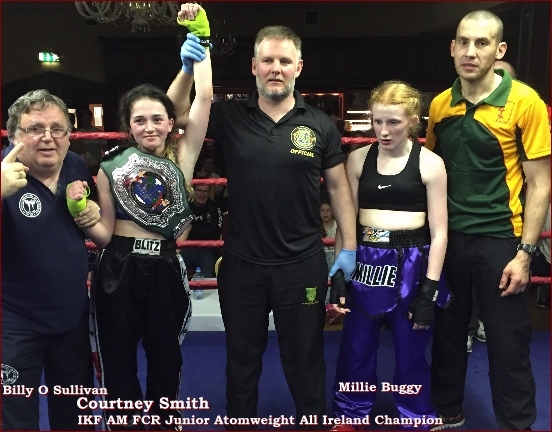 Sarah Worsfold was this evening making the second defence of her IKF European title against the excellent Regina Fanning. Only a year ago Worsfield would not have been a match for Fanning but she has matured into a solid, confident champion and tonight was a master class for her. The first round was controlled with straight punches and even spinning back fists, progressing into the second with side kick / punch combinations. Fanning decided to close the range down and had some success creating a swelling under Worsfolds eye, which looked as though it may become a problem. However, the corner handled it well and in the third as Fanning rallied to capitalise on this she came up short to Worsfolds quick combinations. The Irish fighter knew a KO was the only option and never stopped looking for it. But Worsfold made the most of this, seemingly unable to miss with straight combinations. 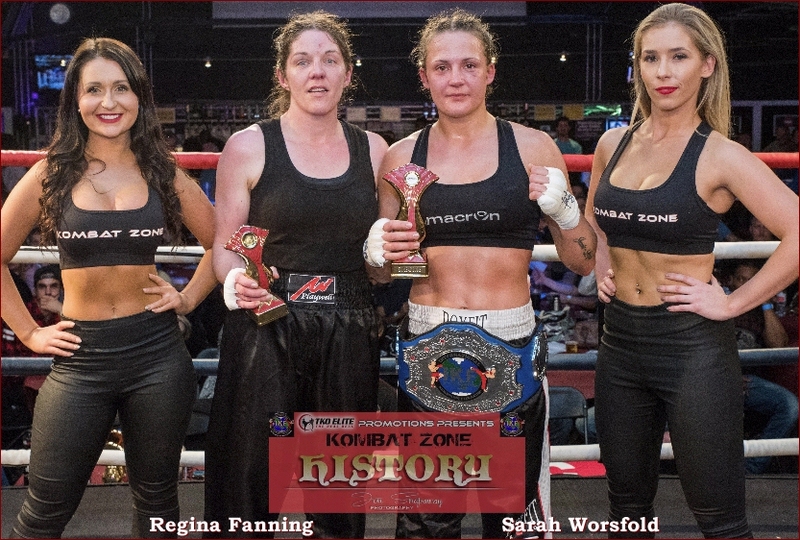 The final round saw an early onslaught from Fanning, again looking for the KO but the English fighter had her measure, coasting to a fantastic victory. Sometimes styles make fights. On any other day Regina Fanning is a joy to watch, but tonight Sarah Worsfold had her number. A mature win that must surely now put her in line for a shot at the World title? WINNER: Sarah Worsfold by unanimous decision 50-45, 50-45 & 50-45. In the sport of Kickboxing you will struggle to find a nicer guy than Eddie Smith. A man who, early on struggled to find a win but never gave up and continued to work hard and dedicate himself to the sport. Having won several major IKF titles under different rule sets, often as the underdog, tonight was no exception as he faced the vastly experienced Zakaria Miri. Southpaw Smith controlled the action in the first with his jab. Miri did not seem to have the power to trouble Smith but he was busy. Smith pressed the action but was always safe, not allowing the Belgians combination to reach or take effect. During the third Smith used his legs more and now his front kick controlled the pace of the contest. Late on in the round Miri tagged him and momentarily the tide looked to turn. But Smith was quickly back in control through to the bell. Miri saw that the Englishman could be hurt and came at him in the fourth, setting up a solid left hook. An immediate response reminded him that it was not over and normal service resumed until Miri got through again with a right hand. This won him the round but a late point deduction for continued knee strikes evened the points tally up on the cards. The final round saw Miri needing a KO and knowing it. But Smith was comfortable now and traded needlessly, just to show that he could. 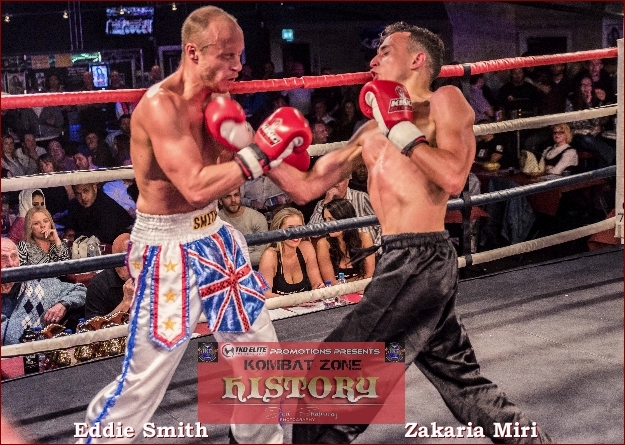 At the bell Eddie Smith added the IKF European title to his collection with a unanimous points win. WINNER: Eddie Smith by unanimous decision, 49-45, 49-45 & 49-48. This much anticipated clash between two solid K1 style fighters absolutely lived up to expectations from the opening bell. The confident Whyte verses the understated Marcelo opened with Whyte's low kicks dominating and his footwork confusing a hesitant Marcelo. Consistent counter kicks stopped Marcelo in his tracks a number of times to see the Crowborough man take the first round. Early in the second Marcelo delivered a thundering low kick of his own and a large mark appeared straight away on Whyte's thigh. Although he did not show the pain it was clear that it was troubling him as Marcelo found his range and dropped the same kick in again and again. Whyte was still in a confident mood and continued with his own combinations. His footwork now was a little slower. In the third Whyte took a count but was straight back into the action. Marcelo worked the front leg causing Whyte to stumble but still he looked very dangerous. Finishing the round the doctor took a look at the leg but allowed the contest to continue. The fourth was dominated by Marcelo and it seemed that only a stoppage would capture the belt for Whyte, who despite showing massive heart, was clearly in a lot of pain. In what seemed like a final attempt he pressured Marcelo but again took more low kicks. At the end of the fourth the contest was stopped by the Doctor and the winner and new champion was Audrius Marcelo. WINNER: Audrius Marcelo by doctor stoppage at the end of round 4. Simon McGrath absolutely came for this title with the bit between his teeth. There was never a moment when he didn't believe he could depose the champion. And so it was! Doughlin, as always was hugely laid back but you knew that as a heavy hitter, the second he connected it would be over. And that could come, as it has in the past, at any point! 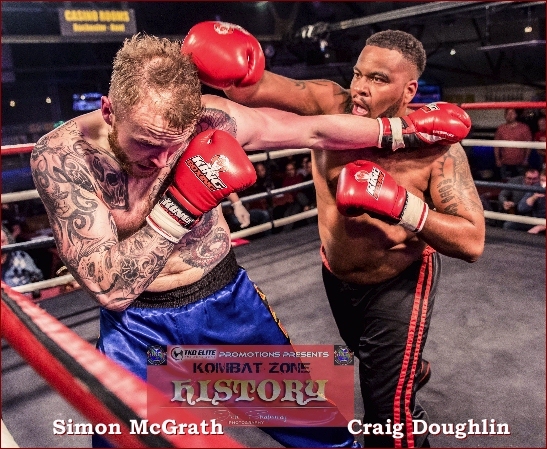 McGrath decided that he would go straight to him anyway and a barrage of kicks and punches saw Doughlin take a little time to decide how he was going to handle it. When he did explode you were on the edge of your seat but all the same it was not enough to take the round. In the second McGrath stepped up and stayed on his toes. Full of confidence he stepped in and out, getting tagged from time to time but keeping it together. There seemed no let up from McGrath so Doughlin began to plant himself and look for the big shot. It was clear he would not out work the challenger at this pace. Then, in the third, BANG! A spinning backfits out of nowhere sent the champion to the canvas, unable to make the count! 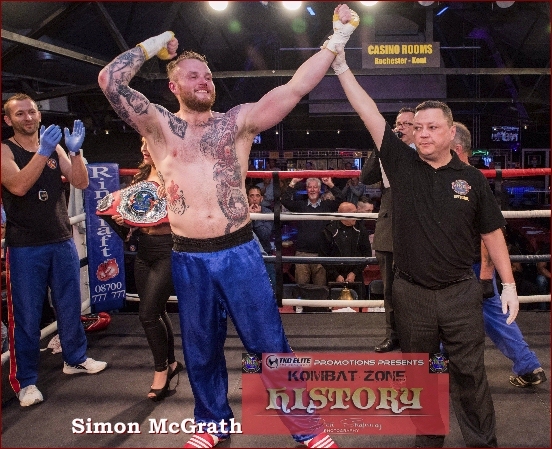 A great, inspired victory for the new IKF Champion Simon McGrath! WINNER: Simon McGrath by KO at 1:13 of round 3. Craig Doughlin has been issued a 45 day IKF Medical Suspension until 29th June 2016. This was, without question the fight of the night. This looked on paper to be a mis-match but with Marsdens Light contact record being included it made things even for this IKF title. At the stare down these juniors looked perfectly matched in height, weight and reach. The first round had everything with combinations and spinning back kicks from both men. Payne was more effective and took two out of three judges nods with the other one even. The second was brutal. It was clear that neither fighter wanted to go the distance. 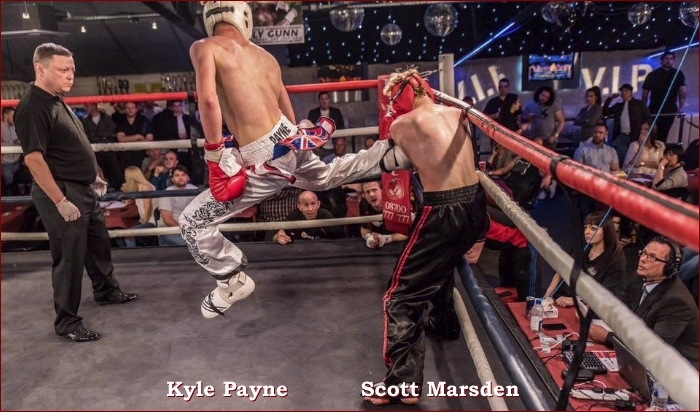 It was even all round but a mid-round onslaught from Payne gave him the upper hand. The third was just as furious with Marsden connecting with excellent head kicks. Payne responded with fantastic combinations to even the round on all three cards. 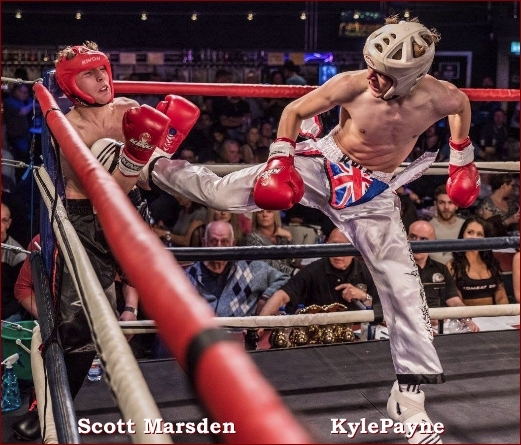 The forth was filled with mature kickboxing usually reserved for high level adults, and was a joy to watch. Great defensive skills from both fighters with Payne just shading it. The final round was just a fight to the end. Both knew it was close, both wanted it. The audience were on their feet as they traded right to the final bell. The result went to a majority decision with two judges going for Payne and one a draw. Congratulations to both fighters on a legendary contest! WINNER: Sham Singh by majority decision, 29-28, 30-28 & 29-29. WINNER: Rytis Vilonis by split decision, 29-28, 28-29 & 30-28. WINNER: Carrie Cooper by RSF at 1:24 of round 1. Jade Berry has been issued a 30 day IKF medical suspension until 14th June 2016. WINNER: Bradley Robinson by RSF at 1:00 of round 2. Marek Belvak has been issued a 30 day IKF medical suspension until 14th June 2016. WINNER: Matt Geere by majority decision, 29-27, 29-27 & 28-28. WINNER: Jamie George by KO at :45 of round 1. Igors Koslovs has been issued a 45 day IKF medical suspension until 29th June 2016. WINNER: Neil Wyborn by KO at :34 of round 1. Robert Destroyeur has been issued a 45 day IKF medical suspension until 29th June 2016. WINNER: Luke Wallace by RSF at 1:40 of round 2. Bradley Fowle has been issued a 30 day IKF medical suspension until 14th June 2016. WINNER: Abi Turp by unanimous decision, 30-27, 30-27, 30-28. WINNER: Draw, 29-28, 29-29, 29-30. 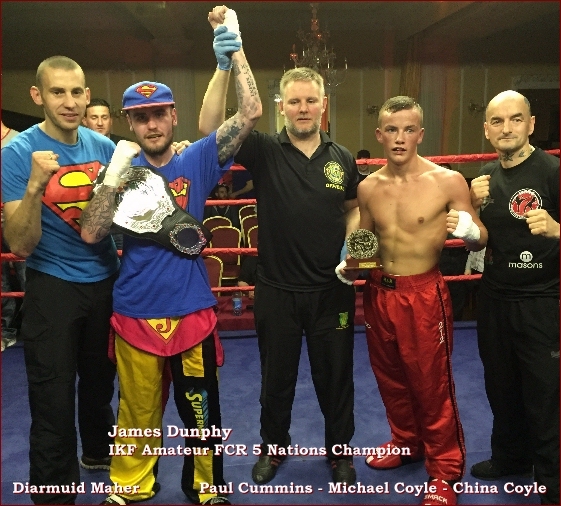 IKF Promoter Diarmuid Maher promoted his first show in the beautiful Seven Oaks Hotel in Carlow on Saturday 14th May and it was a resounding success with a packed house. Diarmuid pulled out all the stops and put on a first class event! The list of positives included of course the well matched exciting fight card but other positives as well. Excellent lighting, professional videographer, live streaming of the fights, beautiful ring girl, class trophies and a very appreciative, sporting audience who accepted the decisions of all the fights without question. Shane Egan (Shannon, Ireland) defeated Marcel Minizewski (Carlow, Ireland) by unanimous decision. 30-27, 30-27, 30-27.
defeated Pijus Dreviniskas (Meath, Ireland, 1-1, 70kg, 5-29-01, Sean O Neill, 087 9262757) by TKO in round 3. Pijus Dreviniskas has been issued a 30 day Medical Suspension For the TKO Stoppage until 14th June, 2016.
defeated Rueben Butler (Waterford, Ireland, 0-1, 47.5kg, 5'1'', 5-10-02, Billy O Sullivan, 085 8589902 ) by unanimous decision. 30-27, 30-28, 30-27.
defeated Peter Sheppard (Galway, Ireland, 1-1, 92kg, 6', 1-4-95, Pete Foley, 087 89119227) by withdrawel in the third round due to a cut. Peter Sheppard has been issued a 45 day Medical Suspension due to Cut until July 8th, 2016.
defeated Luke Burke (Carlow, Ireland, 16-3, 58kg, 5'9'', Patsy Whelan) by unanimous decision, 30-27, 30-27, 30-27.
defeated Dean Knight (Bray, Ireland, 5-12-1, 70kg, 5'8'', 4-11-87, Stefan Moriarty, 087 7920186) by unanimous decision, 30-28, 29-28, 30-27.
defeated Jordan Clarke (Kilkenny, Ireland, 0-1, 60kg, 5'8'', 5-20-99, Billy O Sullivan, 085 8589902) by unanimous decision, 30-27, 30-27, 30-28.
defeated Terence Torres (Shannon, Ireland, 5-3, 58.5kg, 11-8-97, Howie Vincent, 086 1256806) by withdrawel after the second round. Terence Torres has been issued a 30 day Medical Suspension due to withdrawel until 14th June, 2016.
and Nathan French (Carlow, Ireland, 3-3-1, 68kg, 5'9'', 12-7-99, Diarmuid Maher, 085 7180586) fought to a draw, 29-28, 29-29, 28-28.
defeated Millie Buggy (Carlow, Ireland, 6-2-4, 50.3kg, 5'3'', 12-11-01, Diarmuid Maher, 085 7180586) by unanimous decision, 48-47, 48-47, 48-47.
defeated Gary Elbert (Galway (Ireland, 9-1-1, 68kg, 5'8'', 04-30-81, Pete Foley, 087 8119227) by unanimous decision, 29-28, 30-28, 30-27.
defeated Gherado Frusci (Carlow, Ireland, 7-7-2, 68.5kg, 175cm, 2-21-81, Diarmuid Maher, 087 7180586) by TKO in round one. Gherado Frusci has been issued a 45 day Medical Suspension For the TKO Stoppage until July 8th, 2016.
defeated Michael Coyle (Derry, Ireland, 5-5-2, 64kg, 5'7'', 1-20-95, China Coyle, 07565383779) by unanimous decision, 49-46, 49-47, 50-45. NO CORNERMAN WRISTBANDS WILL BE ISSUED ON FIGHT DAY!! Theron Angjuco NEEDS TO GET IKF LICENSED: CLICK HERE. Theron Angjuco NEEDS TO HAVE A FULL PHYSICAL. CAN BE DONE BY EVENT DOC AT WEIGH-INS FOR $40: CLICK HERE. Kevin Kyburz NEED TO SUBMIT AN IKF UPDATE FORM: CLICK HERE. Alfonso Alcocer NEEDS TO HAVE A FULL PHYSICAL. CAN BE DONE BY EVENT DOC AT WEIGH-INS FOR $40: CLICK HERE. Sung Kim NEEDS TO GET IKF LICENSED: CLICK HERE. Robert Renier NEED TO SUBMIT AN IKF UPDATE FORM: CLICK HERE. Thai-Ngan Le NEEDS TO GET IKF LICENSED: CLICK HERE. Thai-Ngan Le NEEDS TO HAVE A FULL PHYSICAL. CAN BE DONE BY EVENT DOC AT WEIGH-INS FOR $40: CLICK HERE. Janet Todd NEEDS TO SUBMIT AN IKF UPDATE FORM: CLICK HERE. Michael Antoci NEEDS TO GET IKF LICENSED: CLICK HERE. Michael Antoci NEEDS TO HAVE A FULL PHYSICAL. CAN BE DONE BY EVENT DOC AT WEIGH-INS FOR $40: CLICK HERE. Rene Orozco NEED TO SUBMIT AN IKF UPDATE FORM: CLICK HERE. Anne Gabriella Maxwell NEEDS TO GET IKF LICENSED: CLICK HERE. Anne Gabriella Maxwell NEEDS TO HAVE A FULL PHYSICAL. CAN BE DONE BY EVENT DOC AT WEIGH-INS FOR $40: CLICK HERE. Magalie Alvarez NEED TO SUBMIT AN IKF UPDATE FORM: CLICK HERE. Caleb Salazar Cisneros NEEDS TO GET IKF LICENSED: CLICK HERE. Caleb Salazar Cisneros NEEDS TO HAVE A FULL PHYSICAL. CAN BE DONE BY EVENT DOC AT WEIGH-INS FOR $40: CLICK HERE. Sovankesa Som NEED TO SUBMIT AN IKF UPDATE FORM: CLICK HERE. WEIGH-INS ENDS AT 8:PM SHARP! BOTH FIGHTERS NEED TO HAVE AT WEIGH-INS A JUNIOR PARENTAL RELEASE FORM: CLICK HERE. BOTH FIGHTERS NEED TO PROVIDE A COPY OF BIRTH CERTIFICATE. Elijah "Eli" Torres NEEDS TO HAVE A FULL PHYSICAL. CAN BE DONE BY EVENT DOC AT WEIGH-INS FOR $40: CLICK HERE. Daniel Arellano NEEDS TO SUBMIT AN IKF UPDATE FORM: CLICK HERE. Merrick Dugger NEEDS TO GET IKF LICENSED: CLICK HERE. Merrick Dugger NEEDS TO HAVE A FULL PHYSICAL. CAN BE DONE BY EVENT DOC AT WEIGH-INS FOR $40: CLICK HERE. Marcos Chupin NEEDS TO SUBMIT AN IKF UPDATE FORM: CLICK HERE. Tyler Lloyd NEEDS TO HAVE A FULL PHYSICAL. CAN BE DONE BY EVENT DOC AT WEIGH-INS FOR $40: CLICK HERE. Justin Cornell NEEDS TO GET IKF LICENSED: CLICK HERE. Justin Cornell NEEDS TO HAVE A FULL PHYSICAL. CAN BE DONE BY EVENT DOC AT WEIGH-INS FOR $40: CLICK HERE. Brenden Hart NEEDS TO SUBMIT AN IKF UPDATE FORM: CLICK HERE. Khai Wu NEEDS TO GET IKF LICENSED: CLICK HERE. Khai Wu NEEDS TO HAVE A FULL PHYSICAL. CAN BE DONE BY EVENT DOC AT WEIGH-INS FOR $40: CLICK HERE. 'Deo' Deofredo Parayno NEEDS TO SUBMIT AN IKF UPDATE FORM: CLICK HERE. Jasmine Sunga NEEDS TO GET IKF LICENSED: CLICK HERE. Jasmine Sunga NEEDS TO HAVE A FULL PHYSICAL. CAN BE DONE BY EVENT DOC AT WEIGH-INS FOR $40: CLICK HERE. Janet Garcia NEEDS TO SUBMIT AN IKF UPDATE FORM: CLICK HERE. Edgar Diaz NEEDS TO GET IKF LICENSED: CLICK HERE. Edgar Diaz NEEDS TO HAVE A FULL PHYSICAL. CAN BE DONE BY EVENT DOC AT WEIGH-INS FOR $40: CLICK HERE. Abraham Hernandez NEEDS TO SUBMIT AN IKF UPDATE FORM: CLICK HERE. 11-14-15: Nestor Munoz was issued a 180 day no training and no competition Medical Suspension until May 13, 2016 by Dr. Mitch Jelen for Knee Injury. 10:57 AM, May 20th: Marcel Warren's trainer ( Dan Black) said they never accepted any fight for Marcel Warren and that he is hurt right now and not fighting. So this bout was scratched. "IKF Point Muay Thai / Kickboxing Sparring Tournament "
155lbs Men and 135lbs Women in 4 Person Bracket Tournament! Location: 3127 Beyer Blvd. San Diego, CA 92154. Children 5 and up can also Compete and win Nice Awards! Done on a Matted Floor! IKF Event Representative: Daniel Hodges. CONTACT: Mr. Aldama at, (619) 666-7696 or at robbie_aldama@hotmail.com. "PKB 3 - IKF POINT MUAY THAI"
For registration information: (707) 761-8601. "FIGHT NIGHT AT USKO RIVERSIDE"
IKF CALIFORNIA Locker Room Inspectors (4): Chris Fields, Victor Zaragoza, Noah Trujillo & Jesse Gasca. 5-14-16: Milissa Bringle was issued a 30 day no training and 45 day no competition Medical Suspension until June 29, 2016 by Dr. Audrey Konow due to TKO. NO SCORES PRIOR TO TKO. 5-14-16: Miguel Canul was issued a 30 day no training and 45 day no competition Medical Suspension until June 29, 2016 by Dr. Audrey Konow due to TKO. Additional 30 Day Disciplinary Suspension added to Miguel Canul's Medical suspension for coming in 6.1 lbs overweight. Suspension Ends: July 29th, 2016. 5-14-16: Bryan Mears was issued a 60 day Disciplinary Suspension for coming in 8.2 lbs Underweight until July 29th, 2016. Bryan Mears' actions left his scheduled opponent Patrick Ventura without a bout. Judge Francisco Granillo: 10-8 Mears. Judge Dan Stell: 10-8 Mears. 5-14-16: Cheol Lee was issued a 30 day no training and 45 day no competition Medical Suspension until June 29, 2016 by Dr. Audrey Konow due to KO. 5-14-16: Jonathan "Ho" Hull was issued a 30 day no training and 45 day no competition Medical Suspension until June 29, 2016 by Dr. Audrey Konow due to TKO. Judge Dan Stell: 20-17 Mears. Judge Francisco Granillo: 30-27 Elizarraras. Judge Luis Cobian: 30-27 Gragg. Judge Dan Stell: 29-28 Elizarraras. 5-14-16: Ray Horta was issued a 30 day no training and 45 day no competition Medical Suspension until June 29, 2016 by Dr. Audrey Konow due to KO. Judge Francisco Granillo: 20-18, Roque. 5-14-16: Dillon Bartman was issued a 30 day no training and 45 day no competition Medical Suspension until June 29, 2016 by Dr. Audrey Konow due to KO. NO SCORES PRIOR TO END OF BOUT. 5-14-16: Sara Ocegueda was issued a 30 day no training and 45 day no competition Medical Suspension until June 29, 2016 by Dr. Audrey Konow due to TKO. (**) 5-22-15: Erin Denti has been APPROVED for 1 Year Until 5-22-2016 with all Additional & Advanced Medical Work. Judge Luis Cobian: 20-17 Denti. Judge Dan Stell: 20-17 Denti. 5-14-16: Emir Rios-Rios was issued a 30 day no training and 45 day no competition Medical Suspension until June 29, 2016 by Dr. Audrey Konow due to TKO. Judge Francisco Granillo: 20-18, Morlett. Judge Luis Cobian: 20-18 Morlett. Judge Dan Stell 20-18, Morlett. 5-14-16: Arman Geboyan was issued a 60 day Disciplinary Suspension for coming in 2.3 lbs overweight until July 29th, 2016. Geboyan was asked to wait for his opponent to weigh-in, but instead, drank water putting him at 120+. 5-14-16: Jordan Miller was issued a 60 day Disciplinary Suspension for NO SHOW until July 29th, 2016. Jordan Miller's actions left his scheduled opponent Matthew Mena without a bout. Was replaced by Clifvon Whiskey prior to weigh-ins. Som Mohanty's opponent Miguel Canul came in 6.1 lbs overweight. Patrick Ventura's opponent Bryan Mears came in 8.2 lbs Underweight. IKF CALIFORNIA & CSAC Event Judge: Cecil Peoples, Nelson Hamilton & Luis Cobian. CSAC Locker Room Inspectors: Roy Farhi, Ernesto Martinez, Brett Correia, Joe Ulrey & Frank Gonzales. CSAC Ringside Physicians: Dr. Blair Kranson & Dr. Jeff Roberts. 5-13-16: Julian Wallace was issued a 30 day no training and 45 day no competition Medical Suspension for a "Hard Bout" until June 28, 2016 by Dr. Blair Kranson M.D. Judge Cecil Peoples: 29-28 Dixon. Judge Nelson Hamilton: 29-28 Carradus. Judge Luis Cobian: 30-27 Dixon. PASSING THE CENTURY MARK EARLY! Anne Maezawa NEEDS TO HAVE A FULL PHYSICAL. CAN BE DONE BY EVENT DOC AT WEIGH-INS FOR $40: CLICK HERE. Anne Maezawa NEEDS TO GET IKF LICENSED: CLICK HERE. Ana Flores NEEDS TO SUBMIT AN IKF UPDATE FORM: CLICK HERE. 5-9-2016: (**) IKF Only has 1 CONFIRMED Bout for Dean Parker's Claimed 5 bouts. 5-9-2016:(**) IKF Did Not Find ANY RECORDS of Jose Antonio Flores' Claimed 10 bouts. UNLESS Both Fighters can FULLY PROVE Their claimed fight record by sending in to the IKF a PAST BOUT HISTORY FORM" - CLICK HERE. Jose Antonio Flores NEEDS TO HAVE A FULL PHYSICAL. CAN BE DONE BY EVENT DOC AT WEIGH-INS FOR $40: CLICK HERE. Jose Antonio Flores NEEDS TO GET IKF LICENSED: CLICK HERE. Dean Parker NEEDS TO SUBMIT AN IKF UPDATE FORM: CLICK HERE. Raul Navarette NEED TO HAVE A FULL PHYSICAL. CAN BE DONE BY EVENT DOC AT WEIGH-INS FOR $40: CLICK HERE. Raul Navarette NEED TO GET IKF LICENSED: CLICK HERE. Ardavan Moeini NEEDS TO SUBMIT AN IKF UPDATE FORM: CLICK HERE. Benjanin Roberts NEEDS TO HAVE A FULL PHYSICAL. CAN BE DONE BY EVENT DOC AT WEIGH-INS FOR $40: CLICK HERE. Benjanin Roberts NEEDS TO GET IKF LICENSED: CLICK HERE. Julian (Jules) Wallace NEEDS TO SUBMIT AN IKF UPDATE FORM: CLICK HERE. 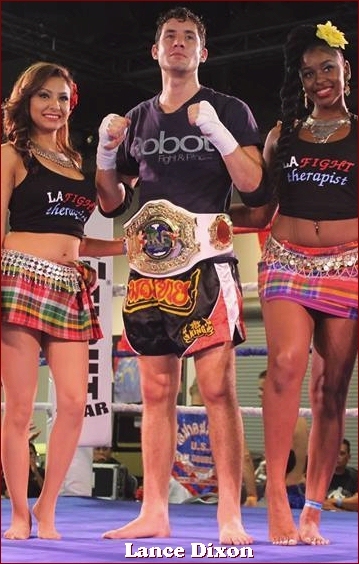 Lance Dixon IS THE IKF AMATEUR MUAY THAI SOUTHERN CALIFORNIA SUPER WELTERWEIGHT CHAMPION. Chris Carradus NEEDS TO HAVE A FULL PHYSICAL. CAN BE DONE BY EVENT DOC AT WEIGH-INS FOR $40: CLICK HERE. Chris Carradus NEEDS TO GET IKF LICENSED: CLICK HERE. Lance Dixon NEEDS TO SUBMIT AN IKF UPDATE FORM: CLICK HERE. Fighters may Throw Knees but Cannot Clinch like in Muay Thai. Fighters will be asked to break as in FCR or Boxing. Foot sweeps are legal to the "FRONT" Foot as long as it is not higher than the ankle. If a fighter's rear is square to the ropes, BOTH feet become targets for a sweep. Andrew Olivarez NEEDS TO GET IKF LICENSED: CLICK HERE. Andrew Olivarez NEEDS TO HAVE A FULL PHYSICAL. CAN BE DONE BY EVENT DOC AT WEIGH-INS FOR $40: CLICK HERE. Ryan Castillo NEEDS TO SUBMIT AN IKF UPDATE FORM: CLICK HERE. Christina Gonzalez NEEDS TO GET IKF LICENSED: CLICK HERE. Christina Gonzalez NEEDS TO HAVE A FULL PHYSICAL. CAN BE DONE BY EVENT DOC AT WEIGH-INS FOR $40: CLICK HERE. Milissa Bringle NEEDS TO SUBMIT AN IKF UPDATE FORM: CLICK HERE. Steve Rios NEEDS TO GET IKF LICENSED: CLICK HERE. Steve Rios NEEDS TO HAVE A FULL PHYSICAL. CAN BE DONE BY EVENT DOC AT WEIGH-INS FOR $40: CLICK HERE. Jake Ramirez NEEDS TO SUBMIT AN IKF UPDATE FORM: CLICK HERE. Bryan Allan NEEDS TO GET IKF LICENSED: CLICK HERE. Bryan Allan NEEDS TO HAVE A FULL PHYSICAL. CAN BE DONE BY EVENT DOC AT WEIGH-INS FOR $40: CLICK HERE. Patrick Ventura NEEDS TO SUBMIT AN IKF UPDATE FORM: CLICK HERE. Travis Bringle NEEDS TO GET IKF LICENSED: CLICK HERE. Travis Bringle NEEDS TO HAVE A FULL PHYSICAL. CAN BE DONE BY EVENT DOC AT WEIGH-INS FOR $40: CLICK HERE. Raymond Elizarraras NEEDS TO SUBMIT AN IKF UPDATE FORM: CLICK HERE. Anthony Roque NEEDS TO GET IKF LICENSED: CLICK HERE. Anthony Roque NEEDS TO HAVE A FULL PHYSICAL. CAN BE DONE BY EVENT DOC AT WEIGH-INS FOR $40: CLICK HERE. Ray Horta NEEDS TO SUBMIT AN IKF UPDATE FORM: CLICK HERE. Emir Rios NEEDS TO GET IKF LICENSED: CLICK HERE. Emir Rios NEEDS TO HAVE A FULL PHYSICAL. CAN BE DONE BY EVENT DOC AT WEIGH-INS FOR $40: CLICK HERE. Richard "Tony" Morlett NEEDS TO SUBMIT AN IKF UPDATE FORM: CLICK HERE. "RISING STARS 3" - "IKF In Gym Training Event"
SUSPENSION: Adam Medina Failed to RENEW his License and Failed to get his Full Physical. Has until May 20th to send in a FULL PHYSICAL from an MD and MAIL IN His License Form & Fees or will have 160 day suspension added. Cary Daughters was issued a 30 day no training and 45 day no competition Medical Suspension until June 21, 2016 by Dr. Mitch Jelen due to kick to back of the head. Fighter complained that he did not feel well, transported to nearest hospital for Health and Safety reasons. WEIGH-INS WILL CLOSE AT 11:AM SHARP!! Truly Bell NEEDS TO GET IKF LICENSED: CLICK HERE. Truly Bell NEEDS TO HAVE A FULL PHYSICAL. CAN BE DONE BY EVENT DOC AT WEIGH-INS FOR $40: CLICK HERE. John Carillo NEEDS TO SUBMIT AN IKF UPDATE FORM: CLICK HERE. Gavan O'Donovan NEEDS TO GET IKF LICENSED: CLICK HERE. Gavan O'Donovan NEEDS TO HAVE A FULL PHYSICAL. CAN BE DONE BY EVENT DOC AT WEIGH-INS FOR $40: CLICK HERE. Mikkel McCune NEEDS TO SUBMIT AN IKF UPDATE FORM: CLICK HERE. Elias Andersen NEEDS TO GET IKF LICENSED: CLICK HERE. Elias Andersen NEEDS TO HAVE A FULL PHYSICAL. CAN BE DONE BY EVENT DOC AT WEIGH-INS FOR $40: CLICK HERE. Jaxon Ray Brown NEEDS TO SUBMIT AN IKF UPDATE FORM: CLICK HERE. Mark Vargas NEEDS TO GET IKF LICENSED: CLICK HERE. Mark Vargas NEEDS TO HAVE A FULL PHYSICAL. CAN BE DONE BY EVENT DOC AT WEIGH-INS FOR $40: CLICK HERE. Levi Smith NEEDS TO SUBMIT AN IKF UPDATE FORM: CLICK HERE. John Mosby NEEDS TO GET IKF LICENSED: CLICK HERE. John Mosby NEEDS TO HAVE A FULL PHYSICAL. CAN BE DONE BY EVENT DOC AT WEIGH-INS FOR $40: CLICK HERE. Raymond Lopez NEEDS TO SUBMIT AN IKF UPDATE FORM: CLICK HERE. Justin Gragg NEEDS TO GET IKF LICENSED: CLICK HERE. Justin Gragg NEEDS TO HAVE A FULL PHYSICAL. CAN BE DONE BY EVENT DOC AT WEIGH-INS FOR $40: CLICK HERE. Darnell Carter NEEDS TO SUBMIT AN IKF UPDATE FORM: CLICK HERE. David Torres NEEDS TO GET IKF LICENSED: CLICK HERE. David Torres NEEDS TO HAVE A FULL PHYSICAL. CAN BE DONE BY EVENT DOC AT WEIGH-INS FOR $40: CLICK HERE. Kenneth Sisaketh NEEDS TO SUBMIT AN IKF UPDATE FORM: CLICK HERE. On 3-5-16: Joel Chavez was issued a 60 Day Suspension until May 6th, 2016 for excessive contact after warnings at rules meeting and during bout. If Again, Suspension will be for Six Months! Cary Daughters NEEDS TO GET IKF LICENSED: CLICK HERE. Cary Daughters NEEDS TO HAVE A FULL PHYSICAL. CAN BE DONE BY EVENT DOC AT WEIGH-INS FOR $40: CLICK HERE. Joel Chavez Jr., NEEDS TO SUBMIT AN IKF UPDATE FORM: CLICK HERE. Aquil Rahman NEEDS TO GET IKF LICENSED: CLICK HERE. Aquil Rahman NEEDS TO HAVE A FULL PHYSICAL. CAN BE DONE BY EVENT DOC AT WEIGH-INS FOR $40: CLICK HERE. Ty Aghedo NEEDS TO SUBMIT AN IKF UPDATE FORM: CLICK HERE. Angel Gonzalez Baez NEEDS TO GET IKF LICENSED: CLICK HERE. Angel Gonzalez Baez NEEDS TO HAVE A FULL PHYSICAL. CAN BE DONE BY EVENT DOC AT WEIGH-INS FOR $40: CLICK HERE. Oscar Deleon NEEDS TO SUBMIT AN IKF UPDATE FORM: CLICK HERE. Judge Susan Thomas-Gitlin: 29-28 Mathews. Judge Bruce Rasmussen: 29-28 Frost. Judge Dan Stell: 30-27 Frost. Judge Susan Thomas-Gitlin: 29-28 Jimenez. Judge Bruce Rasmussen: 29-28 Germono. Judge Dan Stell: 30-27 Jimenez. Defeated **Brian Bernardino (Hayward, California, USA, 2-1, 194, 5'9", 1-13-94, Evan Esguerra, (415) 740-7841, - (FP: 4-29-16) - (RN: 4-29-17) - (LU: 5-2-16) by KO at 1:09 seconds of round 1. Brian Bernardino was issued a 30 day no training and 45 day no competition Medical Suspension until June 15, 2016 by Dr. Mitch Jelen. Defeated Juan Gonzalez (Fremont, California, USA, 2-2, 126, 5'8", 2-4-93, Tong-Uam Naruepon, (510) 717-2855, - (FP: 6-28-15) - (RN: 6-28-16) - (LU: 5-2-16) by KO at 1:40 seconds of round 1. Juan Gonzalez was issued an undetermined date Medical Suspension until he is cleared by his physician with no less than, 30 day no training and 45 day no competition by Dr. Mitch Jelen. Mr. Gonzalez was transported by ambulance to the nearest trauma center after evaluation by Dr. Jelen in the ring immediately following the K.O. It was determined by Dr. Jelen that Mr. Gonzalez's symptoms required immediate attention to be further evaluated by physicians at the nearest trauma center. Suspension clearance to be determined. Judge Susan Thomas-Gitlin: 29-28 James. Judge Tim Stell: 30-27 Warren. Judge Dan Stell: 29-28 James. Dominic Sumner was issued a 30 day no training and 45 day no competition Medical Suspension until June 15, 2016 by Dr. Mitch Jelen. Judge Susan Thomas-Gitlin: 20-17 West. Judge Tim Stell: 20-17 West. Judge: Michael Rinaldi 20-17 West. Defeated **Adrew Capurro (Oakland, California, USA, 9-8-1/2, 142, 5'8", 3-8-86, Phicheat "Gunyao" Arunleung, (415) 570-3253, - (FP: 10-24-15) - (RN: 10-24-16) - (LU: 5-2-16) by TKO at 1:42 seconds of round 5. Andrew Capurro was issued a 45 day no training and 60 day no competition Medical Suspension until June 30, 2016 for TKO and hard fight by Dr. Mitch Jelen. Judge Susan Thomas-Gitlin: 40-36, Ycaro. Judge Tim Stell: 39-37, Ycaro. Judge: Michael Rinaldi 40-36, Ycaro. Buahin came in 5 lbs Over the maximum weight limit. However, Lee came in 4 lbs Below the Minimum weight limit. Both Given Minimum 30 Day Disciplinary Suspension for not making weight. Espinosa was able to compete, However Tyler had an Orbital Injury in 2014 that was Never Cleared. - Date unknown but Not under the IKF regulation.